Today students across the country are walking out of school to protest violence and demand gun control reform. Where do Americans stand on this issue, and have their views changed over time? Government policy makes it difficult to research gun violence in the United States, but we do have some trend data from the General Social Survey that offers important context about how Americans view this issue. 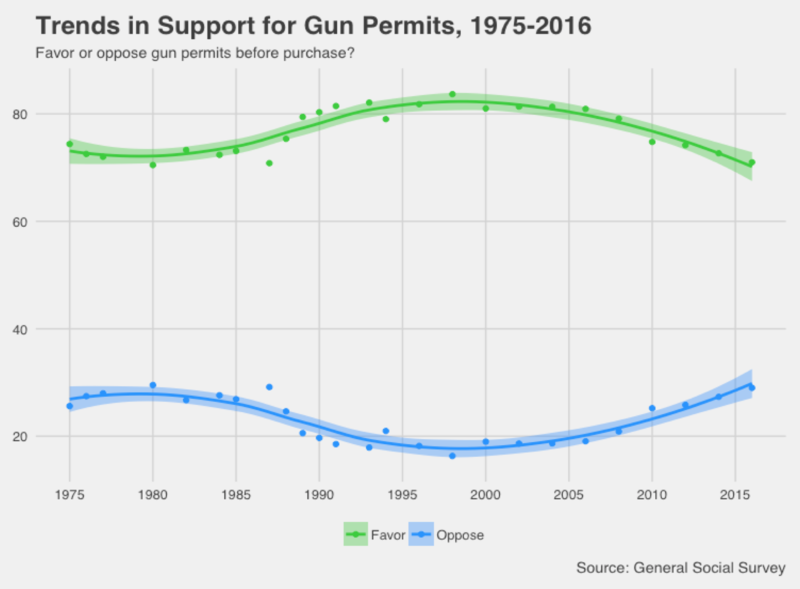 For over forty years, the GSS has been asking its respondents whether they “favor or oppose a law which would require a person to obtain a police permit before he or she could buy a gun”—a simple measure to take the temperature on basic support for gun control. Compared to other controversial social policies, there is actually widespread and consistent support for this kind of gun control. In light of the Second Amendment, however, the U.S. has a reputation for having a strong pro-gun culture. Is this true? It turns out there has been a dramatic shift in the proportion of respondents who report even having a gun in their homes. 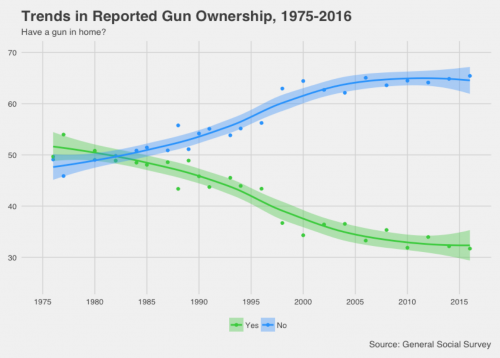 Despite this trend, gun sales are still high, suggesting that those sales are concentrated among people who already own a gun. Recent controversies over gun control can make it seem like the nation is deeply and evenly divided. 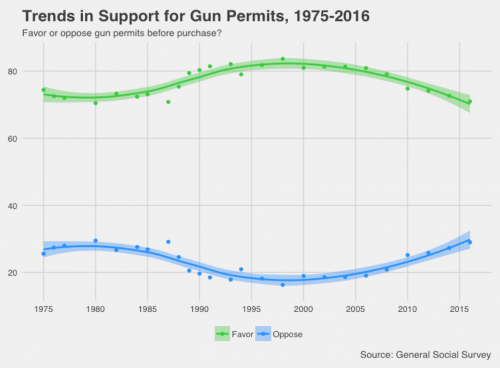 These data provide an important reminder that gun control is actually pretty popular, even though views on the issue have become more politically polarized over time. Ryan Larson is a graduate student from the Department of Sociology, University of Minnesota – Twin Cities. He studies crime, punishment, and quantitative methodology. He is a member of the Graduate Editorial Board of The Society Pages, and his work has appeared in Poetics, Contexts, and Sociological Perspectives. Question: are these the only gun-related questions in the GSS?